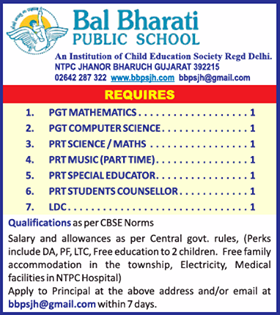 Bal Bharati Public School, Gujarat has advertised in THE TIMES OF INDIA Newspaper for the recruitment of PGT plus PRT job vacancies. Interested and eligible job aspirants are requested to apply with in 7 days. Check out further more details below. About School: The Child Education Society (CES), the apex body of Bal Bharati Public Schools and other institutions of higher education, was set up in the year 1944 during the pre-independence era when the elders thought that Indian culture, heritage, tradition and ethos must be preserved and fostered. In order to achieve these objectives, it became obligatory for the Society to educate the young people. Thus, the Society was registered under the Registration of Societies Act, 1860.